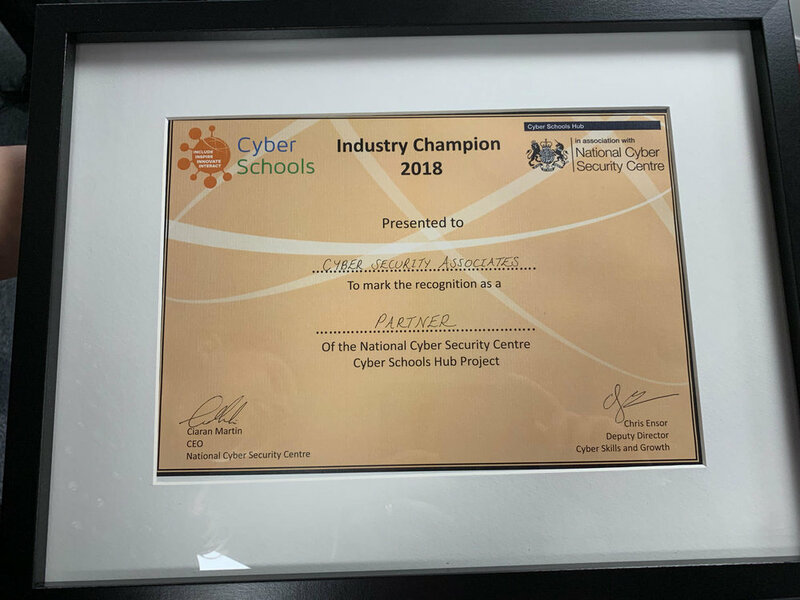 Since early 2018, Cyber Security Associates (CSA) has been working with the UK Governments National Cyber Security Centre (NCSC) as an industry stakeholder for the Cyber Schools Hubs initiative. Through a number of inspirational leader talks, over 30 work experience students and the creation of the CyberPi Projects (www.cyberpiprojects.com) and the Cyberdea Immersive Zone (www.cyberdea.com) CSA have provided the opportunity for Gloucestershire students to have a hands-on experience of cyber security. Following the first-year success of the project, the NCSC hosted their first awards evening to celebrate the work of students, teachers and industry stakeholders. The awards were kindly hosted by Allcoopers, in Gloucester. CSA were delighted to be the winner of the Industry Champion 2018 Small Enterprise Category, and to be awarded formally ‘Partner’ status of the Cyber Schools Hub project. One student quoted that CSA had ‘opened their eyes to the endless possibilities that they now have in front of them’. CSA are overjoyed to know the work they are doing is making a real difference. If you’d like to talk to CSA about the work they are doing with schools, please get it touch.